Would you like a simple, easy-to-open, gift wrap idea? This box was still sturdy, but, well, OK, it looks kind of scruffy. Sticking square duct tape on a square box is pretty simple. I did not worry about the ends. 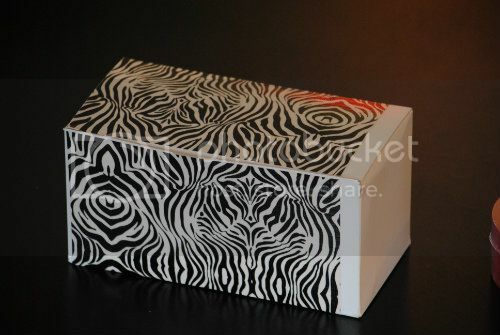 One corner of the box has a ding, AND the zebra wasn't quite big enough for the whole top. It needs a little color anyway. So, I added a zip of red! Here's my gift! It hopped right into the box with some red tissue paper and a couple of candy canes! Hello, Snazzy! I love this post Marci! 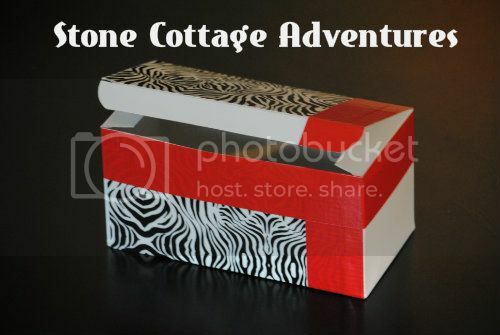 I would have never thought to dress up a box with duct tape! 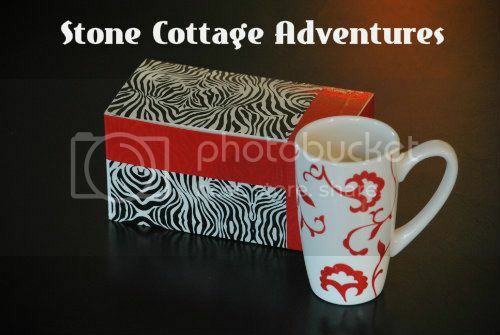 It looks so elegant...not to mention it matches that cup perfectly! Sweet! NOW I know what to do with my several rolls of fancy duct tape!! Excellent idea! Great way to re-purpose the box, and it looks awesome. I'm a new GFC follower, here from the blog train hop! My husband is a handyman. . .hmmmm, I have blue painter's tape and gray duct tape. I feel so "yesterday." Wow...duct tape...who knew. 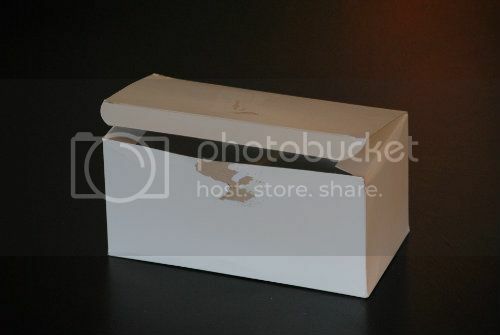 Great idea to repurpose boxes that need a little help. Luv the picture of your pups. A new follower from the Meet and Greet Blog Hop. Hope you can stop by my blog as well. I never would have thought to use duct tape. It looks great! You're nominated for the liebster!! What a great transformation! That turned out great. 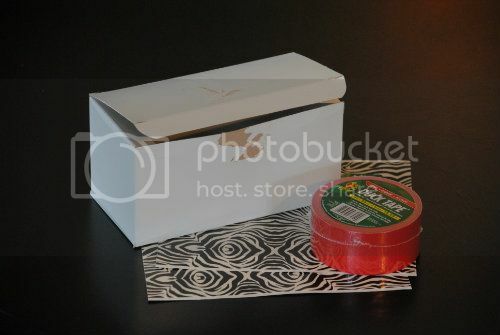 I love all the cool designs that duct tape comes in now! Great Presentation…This Black and White is honestly a colorful innovation!!! The puppies, spider, flowers set a real world and something amazing which is great to every naked eye. Truly the ideas have given a better meaning related with so many worlds.